Smart lights may seem frivolous, but these clever lighting systems can be a practical convenience. They can automatically turn on the lights when you get home, so you aren't fumbling around in the dark for switches. And if you need to dim the lights for family movie night, all you have to do is ask your voice assistant of choice. And if convenience doesn't appeal, these lights can be a lot of fun, too, with multicolored lighting options to set the perfect mood. And now our favorite smart lights are taking on the great outdoors: Philips Hue is launching its first outdoor fixtures. If you've used Hue lights before, the new outdoor lights work in the same way — the difference is that they're designed for use outdoors. Everything has easy plug-and-play installation, and you control it all through the Hue app. You'll now be able to use the app to turn both your indoor lights and outdoor lights on or off, as well as setting schedules and programming unique lighting scenes. These splashy new lighting fixtures will do a lot to dress up your garden. The Hue Lily is a spotlight that's perfect for highlighting the best bits of your landscaping — or just setting the mood for your next outdoor event. And because you could hardly have just one, the Lily sells in a three-light pack for $280. But while the Hue Lily is all about style, the Hue Calla is a bit more practical. The Calla is a bollard-style light designed to line outdoor paths so no one trips in the dark. It sells for $130 for a light and power supply. Both lights offer 16 million color variations, which you can program to your perfect lighting setup or adjust on the fly using your mobile device. Whichever you choose, it's sure to make an impression. But if all you want simple security lighting, Hue offers a few options. There are bright white floodlights ($30 each) as well as wall-mounted fixtures for your patio or porch (starting at $50). 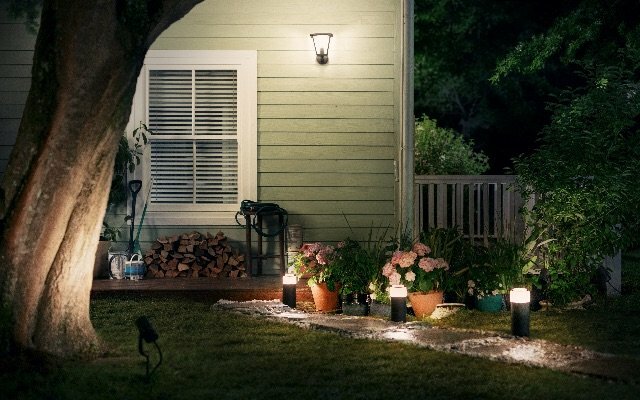 If the more elaborate lighting setups Hue offers put a strain on your budget, these basic outdoor lights can give you smart lighting at a more reasonable price — just don't expect to be able to produce all of the crazy colors of the Lily and Calla lights. If you're looking for outdoor smart lights, Philips is really the only game in town right now, and their outdoor lights are as good as the indoor lights we already love. Plus, if you already have a Philips Hue app, you'll be able to easily control all of your lights — indoors and out — with just a few quick taps. 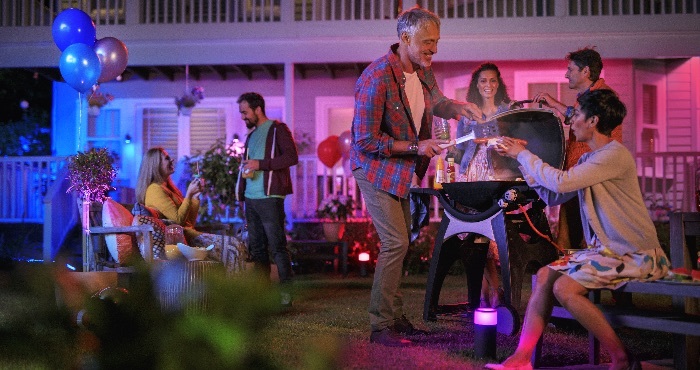 Philips Hue outdoor lights will be available starting this July, so you can pick some up just in time for that big summer barbecue.